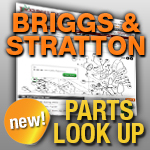 We have Briggs and Stratton Piston Kits, Piston Ring Sets, and individual pistons and rings for your lawn mowers and other 4-cycle small engine equipment. Keep those engines running efficiently! Match your part number or engine model below to find replacement pistons and pistons rings.